Airsoft, Pistol, Rifle and Shotgun BB Guns. Loading Action: Cocking - Single ShotColour: RedWhat's Included:BB Pellets Torch (not warranted)..
P328B Small Handgun (Gold and Red), Packed in hard plastic case for easy carry and storage, single Shot, only 6" in size.Specification: - 140 FPS - 7 Round Magazine - Hop-Up - Strong ABS - With Black ABS Carry Case - Colour Coded Trigger - Comfy Palm Grip.. PLEASE NOTE THIS GUN COMES IN ORANGE, AS BLUE IS SOLD OUT!Features: • Action: Spring Pistol • FPS:250 • Magazine: 6 Round BBs • Range: 52m • Spin Up Yes • Half Metal • Extended Barrel RevolverIncludes: • UA941U Airsoft Pistol • Magazine X 6 • Small Bags of BBs • 2 X Paper Tar..
1:1 Scale Replica of the Smith & Wesson Model 1911, used by the U.S. Military for over 75 years.​Features:• Gas Powered • Magazine Capacity: 10 BBs • FPS: Approx. • Semi-Auto FiringIncludes: • HG123 Gas Pistol.. Specifications: - 1:1 Scale - Made by Double Eagle - 320 FPS - Fires Single and Fully Automatic - 87 cm in Length - Weighs Around 2 Kilo’s - ABS Gearbox - Made from ABS and Metal - 250 Round Wind Up Magazine - 30 – 35 Meter Range - 3 x RIS Rails - Includes Flash Light - Includes Red Dot.. Features: • Bulldog Brand • High Polished 6MM Pellets • Super Accuracy • Light Weight 0.12G • Suitable for all Airsoft GunsIncludes: • 10000 0.12G Yellow Pellets.. 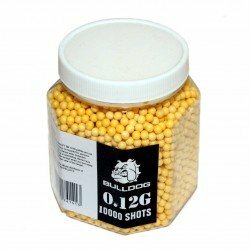 Features: • Bulldog Brand • High Polished 6MM Pellets • Super Accuracy • Light Weight 0.20G • Suitable for all Airsoft GunsIncludes: • 1000 0.12G Black Pellets in Tub.. Features: • Bulldog Brand • High Polished 6MM Pellets • Super Accuracy • Light Weight 0.20G • Suitable for all Airsoft GunsIncludes: • 1000 0.12G White Pellets.. Features: • Bulldog Brand • High Polished 6MM Pellets • Super Accuracy • Light Weight 0.20G • Suitable for all Airsoft GunsIncludes: • 10000 0.20G Black Pellets..